Screen resolution determines the size and clarity of the images and text on your screen. Higher resolutions like 1920 x 1080 make the images and text on your screen look smaller and clearer, while lower resolutions like 800 x 600 make it look larger. 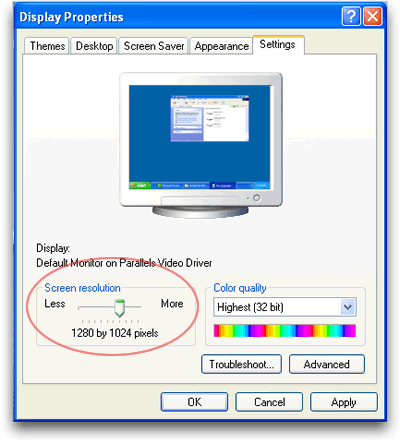 The resolutions available for your computer depend on the size of your screen and most screens have a recommended resolution for optimal performance. Choosing a screen resolution with the wrong aspect ratio for your screen can cause the display to look stretched out or compressed. 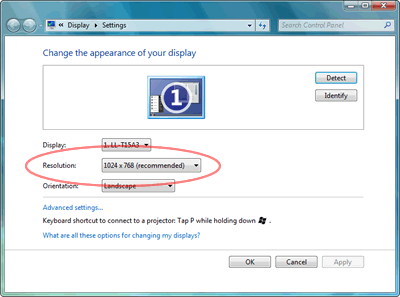 A widescreen display can have an aspect ratio of 16:9 (1280 x 720), while a full screen displays aspect ratio would be 4:3 (1280 x 960). 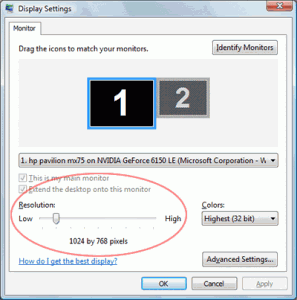 Here I will explain how to quickly and easily change the screen resolution on your laptop computer in the Windows XP, Vista and 7 operating systems. In the Display Properties window that opens click on the Settings tab. Drag the Resolution slider left or right to select your desired resolution. In the window that opens click the Resolution drop down list and drag the slider up or down to select your desired resolution. After deleting a program and a restart yesterday, my screen ratio changed (Gateway laptop Windows XP). I just followed your instructions, but the slider actually only would go on the lowest ratio (800 x 600) or the high end (1024 x 768)–no other choices in between. And the screen is out of focus on both of those settings. What am I missing here or what else can I try? That sounds like a driver issue. You may need to update/install new drivers for your graphics card. They may have been deleted or corrupted when you deleted the program.